The Black Friday craze has come to auto showrooms. The Thanksgiving holiday used to be nothing special for auto sales. But since dealers have begun promoting Black Friday specials, "Thanksgiving weekend accounted for twice as many sales as any other weekend in November last year," said industry analyst Jessica Caldwell of Edmunds.com, who expects a repeat of that performance this year. Research in advance what you think is a bargain for the model you crave. Make sure which dealerships are pushing the big discounts. Promotions can vary by region, and not all dealers take part in the manufacturers' deals. Check individual dealership websites before you go shopping. Go early. Even if you strike a deal quickly, delays are likely getting through the finance department. Don't expect lengthy negotiations. With many shoppers on the lot, sales people will be eager to move on to the next prospect. If the promoted price is indeed a good deal, be ready to go for it. Now here is a rundown by car brand of some of the best deals to be had over the Thanksgiving weekend. Most of the biggest discounts are on 2015 models that have been on the dealer's lot for some months. Buick: Cash back of up to $8,000 is on offer when buying 2015 models of the LaCrosse, Regal and Veran0 sedans and the Enclave SUV. Buick also is offering a lease deal on the 2015 Encore small SUV for $175 a month for two years with just $175 down if you are currently leasing a non-General Motors vehicle. 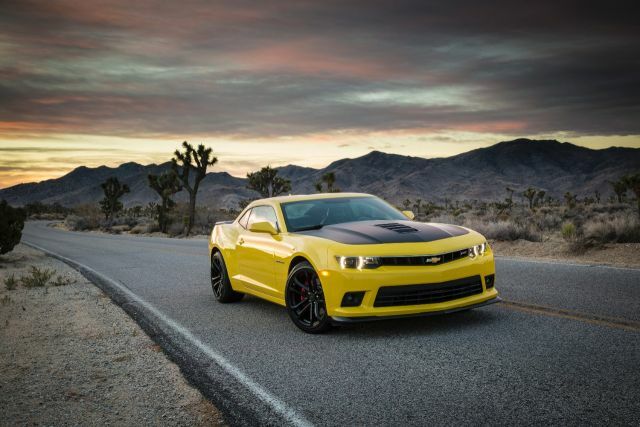 Chevrolet: Chevy is offering 20 per cent cash back on 2015 Cruze, Impala and Malibu sedans and the Camaro SS sport coupe pictured above. GMC: You can get 15 percent cash back on the 2015 GMC Sierra pickup and the Acadia and Terrain SUVs. Chrysler: Chrysler is offering zero-percent financing for 75 months (assuming your credit rating is good) on the 2015 Chrysler 300 and the Chrysler 200 -- in this case including the 2016 model. Ford: In its "Friends and Neighbors" pricing promotion, Ford offers you the same price available to the company's suppliers and business associates. The percentage discount varies by model but usually means a price close to the dealer invoice number. Nissan: Cash back offers are up to $1,000 on 2015 models including the Altima, Sentra and Versa sedans, the Rogue small SUV, and the Titan pickup. Audi: Luxury brand Audi is offering a $750 to $1,000 bonus on leasing its 2016 models. These include the A3, A4, A5 and A6 sedans and couples and the Q5 SUV.